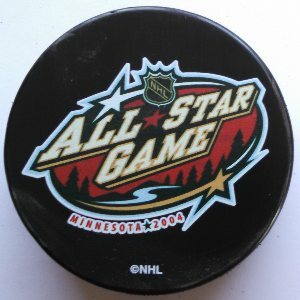 Eastern Conference 6, Western Conference 4 - This All-Star Game was played in Minnesota, home of the Wild. Made by Sherwood Hockey. NOTE: Prices shown are for less than 12 total pucks. Discounts are: 12-49 pucks @ $3.90 ea. / 50-99 pucks @ $3.55 ea. / 100+ pucks @ $3.30 ea. Click on the total amount of non-game pucks for this order to get discount. You can mix or match ALL non-game style pucks to get quantity discount.